Weather is one of those things that happens. In fact, weather happens every day. In further fact, weather happens every day everywhere. Proving that humanity continues to be as superstitious as our ancestors ever were, there have been lots of theories about why the recent hurricanes have occurred. Actress, Jennifer Lawrence, says that it is “nature’s wrath” for the election of Trump. Stevie Wonder said anyone who doesn’t think climate change caused it is “blind” (it’s unclear whether he was making a pun). Kirk Cameron is the celebrity with the perhaps the best answer, which was essentially the Providence of God. One charismatic preacher claimed that it was meant to resemble a sonogram of a baby, and blamed abortion. Other charismatics have also claimed to know the specific divine reasons for these hurricanes. And then, there’s the whole class of charismatic prophets who decreed and declared that the hurricanes would miss the American mainland (they seemed less concerned about the islands). After all, Kenneth and Gloria Copeland claim to be able to control the weather. It only makes sense that if the Copelands can control hurricanes, charismatics – who believe that all Christians can experience prophetic gifting – everyone should be able to control the weather. And, America’s charismatics have been a little let down about their ability to decree hurricanes changes their course. 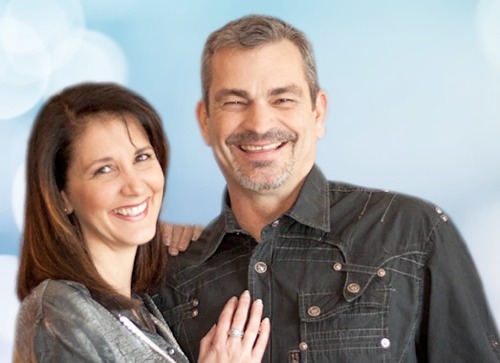 One such failed prophetic weather-changer is Johnny Enlow, who Charisma Mag told us prophesied “financial breakthrough” in September of 2016 (did you receive it?). Enlow was one of those decreeing and declaring the hurricanes change their course. On Facebook, Enlow had some explaining to do for the charismatic inability to control the weather, despite their fantastic claims. He acknowledges that maybe the charismatic community hasn’t got the whole “controlling the weather” thing down yet. Enlow and other charismatics should figure out that “decreeing and declaring” isn’t really a thing, Biblically. In fact, that notion comes from “little god” theology and is a mark of the heretical Keynonism that plagues modern charismaticism. However, like a fool returning to his folly and a dog to its vomit, Enlow doesn’t repent of the notion of declaring changes in the weather, he says that they just haven’t figured it out yet. He also claims that their decrees and declarations probably made the hurricane “better” than it would have been otherwise. 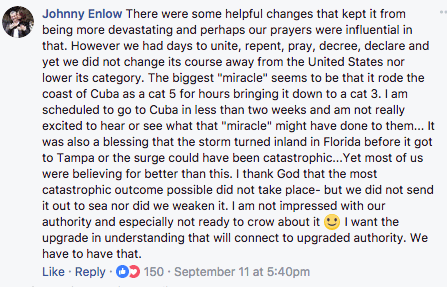 Enlow’s Facebook post is full of charismatics claiming that their prayers actually did change the severity of the hurricanes. Charismaticism seems to be a mental disease. Faith-Healer Asks For Prayers…For Healing. No. Really.